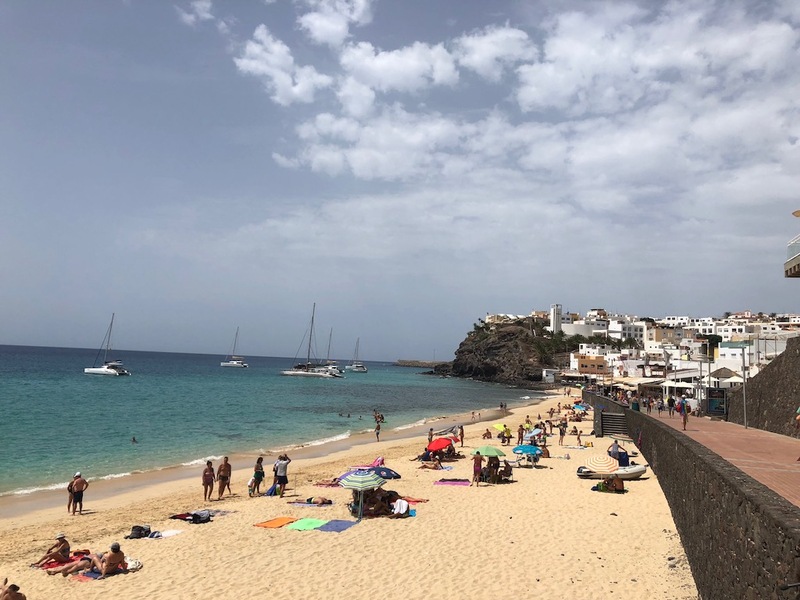 We really enjoyed our day trip to the south of Fuerteventura, there’s beautiful beaches, old town tapas bars, fresh fish restaurants and a harbour to be found in Morro Jable. In fact next time we island hop, this is where we are heading to! Admittedly it’s not the easiest place to get too. A coach transfer from the airport must be a drag! For the reason that once you’ve left Caleta de Fuste behind, there isn’t much scenery of interest for the next 60km. We spotted a goat herd, 2 cheese shops, a race track, a bio farm and Oasis Park. In contrast our excitement increased, as the bare volcanic landscape lightened from a dusty brown to a white blond. We kept catching glimpses of stunning beaches with turquoise water in the distance. First of all we started at the Muelle in Morro del Jable, as I wanted to visit the turtle nursery. The Guardería de Tortugas is set back on the second road near the Cofradía de Pescadores restaurant in the harbour. Injured turtles are taken to this centre for recuperation, before they can be released. Entry is free and limited to a maximum of 15 visitors at any one time. There is a donation box and information boards, as well as selection of tanks with adult turtles in. Visitors were restricted to viewing two large tanks, the others are roped off. What’s encouraging is the project to reintroduce the loggerhead turtles (Caretta Caretta) to the Canary Islands. Donor turtle eggs from Cape Verde have been hatched in Fuerteventura since 2006 and released on Cofete beach. It remains to be seen if these turtles will return in the future to lay their eggs on this beach. The nursery is open Monday to Friday from 10:00 to 13:00. Our next stop was the old town area of Morro del Jable. It was a delight to find that this fishing village has retained some of the charm and character; despite developing into the second most popular holiday resort in Fuerteventura. The old town has beautifully paved and planted pedestrian streets, with pavement cafés and tapas bars. On the front fresh fish restaurants jostle for space along the promenade and the boat excursions anchor off shore. The old town is nestled between two hills and divided by the Barranco del Ciervo. There is free parking in the car park on the corner of Calle Guardafía and the Avenida de la Constitución. We walked the 2 main shopping streets in the old town, taking Calle Nuestra Señora del Carmen down to the front, and the parallel Calle Diputado Manuel Velázquez Cabrera back to the car. Whilst walking along the promenade by the old town, we came across a couple of Barbary ground squirrels – often referred to as chipmunks in Fuerteventura. Once you follow the promenade and beach out of the old town, it’s difficult to know where the resort of Morro Jable meets Jandía as they blend into one. The Playa del Matorral stretches for 3km, with Playa Gaviotas in the distance, if you want another kilometre of natural white sand beach to enjoy in Jandía. Personally I love the wide open space on the front in this resort. For the reason that the beach is divided from the road by the Jandía salt marsh. Furthermore there are running and cycle lanes between the beach and the dual carriage way Avenida del Saladar. Visitors needn’t worry, you can still find plenty of shops, bars and restaurants along this strip. The Morro Jable lighthouse is a distinctive feature, standing at 59m high and constructed in 1991. Boat trips depart from the harbour, tourists can choose from a catamaran, Turkish Gulet or party boat with music. The distance from Fuerteventura (FUE) airport to Morro Jable is 85km. We drove 120km from Corralejo which took around 1 hour 45 minutes. The coastal road through the dunes is currently closed for 2 months. As a result we drove the new section of dual carriageway on the FV-1 which is excellent.